An example of a home in northern MN that uses an insulated sand bed under the home to store solar heat for space heating the home. The house is 600 sf and has a 2 ft deep sandbed under the concrete floor slab. 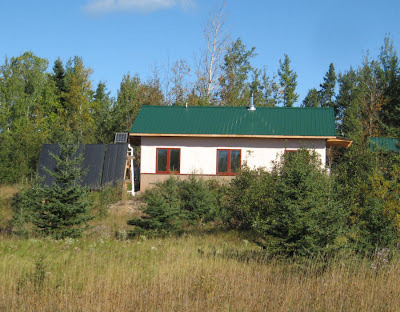 The home is well insulated with strawbale walls and R60 ceilings. About 160 sf of conventional solar thermal collectors add heat to the sandbed on sunny days. The heat from the sandbed is conducted directly into the living space through the floor slab. After 3 years in the house, the owners are very happy with the house both from an energy saving and comfort point of view. Thanks very much to Maureen for providing the details.